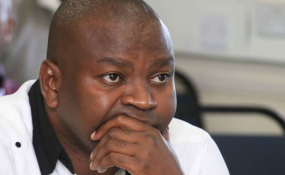 Sports, Heritage and Culture Cabinet Secretary Rashid Echesa. Two people arrested alongside eight Pakistani girls at a club in Nairobi have been detained four more days for police to finish their probe on human trafficking. They are Mika Osichiro and Safendra Kumar Sonwani, the owner of Balle Ballle Club in Parklands, Nairobi County. Police arrested Mr Kumar and the girls at the club on January 1 and took them the Parklands station. In the ruling, Senior Principal Magistrate Kennedy Cheruiyot said the suspects will be held until January 8, when police will have looked into matters including the authenticity of the girls' travel documents. The order followed a request by the State, which had wanted Mr Osichiro and Mr Kumar held for police to establish whether they were involved in human trafficking. Defence lawyer Evans Ondieki applied for the release of the girls, saying they were in Kenya legally. Mr Ondieki presented documents signed by Sports, Culture and Heritage Cabinet Secretary Rashid Echesa, allowing the girls to be in the country as cultural dancers. He asked, "Are police struggling to implement the directive of Mr Echesa?" The lawyer also noted that the girls paid a Sh45,000 fee for special permits. Mr Ondieki also pleaded with the court for the girls to be moved from the police station to a safe house and be allowed to bathe and change their clothes. "They have not bathed for the last one week. They are women ... nature demands that they be clean," he said. The magistrate ordered the release of the girls to Nadeem Khan, the proprietor of a non-governmental organisation known as Blue Heart, which campaigns against human trafficking and child abuse. Police and Mr Khan will ensure the girls do not leave the country. The eight were released on a free bond. They and Mr Kumar will return to court on January 8 for directions.